guration of perception controllers in contrast to the conventional stimulus-response model whereby output is generated as a function of input. rst place; no stimulus, but a “response”? rst person has a goal to watch football so acted to achieve that goal by switching on the television. The other watchers have an on-going football-watching goal which came into focus when the football became available. The remaining people lacked any goal to watch football so showed no interest. The basic perceptual control unit. Each function (the circles) transform one or more signals (the lines) to other signals. gure. The lines represent signals and the circles functions, which transform one or more signals into other signals. The components approximate to neurons of the nervous system, and the type of basic operations thought to be performed by them, with the signals being the equivalent of neural impulses. input signals, perhaps a weighted sum, the reference signal, r, which represents the desired value of the perceptual signal,  the comparator (comparison function) which compares (usually a subtraction) the reference and perceptual signals, and emits a corresponding error signal, e, the magnitude of which represents how far the perception is from the desired (reference) value, the output function, which transforms the error signal in to some output, o, of the whole unit. At the interface with the physical environment this might be a signal to change muscle tension. ects the perception, in the environment, which includes the output and any disturbances. ffects (feedback) the perception, in such a way that it is brought closer to the reference state, thus the error is reduced (the feedback is negative). For any unit in the hierarchy the output of the unit could be thought of as setting, or contributing to, a lower level goal, that would help it achieve its own goal. ects on the controlled variable, the car’s position. However, there is no need to detect disturbances as the outcome of the operation of a perceptual control system is to protect the controlled variable from any disturbances. If anything were to disturb the variable then (within physical limitations) the error would increase and, so, there would be compensatory output to bring the perception back to its desired state. It follows from this, that a control system can be at a state of rest, in that there is no error, but there could be non-zero output which would reflect the sum of disturbances. For example, the steering wheel may be turned one way to counteract the wind acting upon one side of the car. 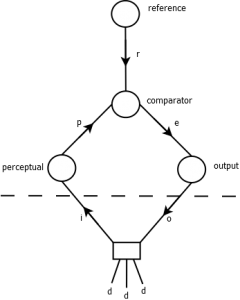 c, output, but to vary the output to achieve the desired input. The iris system that controls the light falling on the retina has physical limitations, but there other ways humans can control that light; squinting, wearing a baseball cap, switching the room light on, shading the eyes with a hand, wearing sunglasses or turning a dimmer switch. The means vary but constant throughout is the common goal of the amount of light falling on the retina. It should be noted that the functions and signals in the control systems do not act in a serial manner, but all act simultaneously and continuously. The PCT view of living organisms as systems with explicit internal motivations, as creatures which are purposefully scurrying, or swimming or flying or driving, around in the world to achieve desired goals is a more credible and comprehensive explanation of behaviour than the impression given by the stimulus-response perspective of animals as automaton-like systems blindly responding to environmental stimuli without any internal purpose. Perceptual Robots has successfully implemented this theory in a set real-world robots for a proof of concept as a springboard for developing flexible, dynamic robotic systems.